Here is today’s English lesson. It is a news story about the impact of climate change on tea production in India. The answers to the exercises will be uploaded to my blog tomorrow. unfavorable-(adj) – unfavourable situations or conditions that are not good. cultivation-(n) - the act of growing or developing. sturdy-(adj) – Strong, firm and not easily destroyed. In India's main tea-growing region, scientists say tea production is being impacted by climate change. India produces nearly one third of the world's tea. The rolling Himalayan hills in India's northeastern state, Assam, are carpeted with lush tea bushes whose leaves produce some of the world's finest teas. But there are concerns that rising temperatures may be affecting the tea plantations, resulting in declining productivity of the brew to which millions of people across the world wake up. The director of the Tea Research Association in Assam, Mridul Hazrika, is studying the impact of climate change on tea production. "We have observed that minimum temperature has rise[n] by two degrees centigrade and there is a reduction in the rainfall in the last 90 years by around 200 millimeters. And this is very important, very significant from the point of tea as a plantation crop," Hazrika said. Scientists say rising temperatures can affect the ability of the tea bush to grow. Tea production in the Assam region has declined in recent years, although the area under cultivation has risen. Erratic rainfall patterns are of particular concern to planters because the tea plant is largely dependent on the weather. They point out that last year there were fewer days with sunshine, resulting in humid conditions which are unfavorable for the growth of the tea plant. Planters are optimistic that the sturdy tea bush will adapt, but they are looking at ways to combat the impact of climate change. 1. How much of the world's tea does India produce? 2. What effect will rising temperatures have on tea production? 3. Over how many years has the rainfall reduced by 200 millimeters? Fill in the blanks using the new vocabulary words listed above. People have worked at _____________ and farming for thousands of years. Global warming could have an ___________ on many animals. He built a ________ house for protection. Her body is trying to ___________ the sickness. The whiskey he drank will __________ his driving. The troubled pop singer was often the target of ____________ news stories. His interest in video games __________ as his interest in girls increased. He had to _________ his diet to his new country. The present progressive describes an activity in progress right now, like "I am typing," or in a more general now, like "I am living in Boston." Circle the word(s) in the sentences below that show the sentences are written in the present progressive tense. In India's main tea-growing region, scientists say tea production is being impacted by climate change. The suffix ‘ion’ changes a verb into a noun, like education. Find the word(s) that ends with -ion in each sentence. "We have observed that minimum temperature has rise[n] by two degrees centigrade and there is a reduction in the rainfall in the last 90 years by around 200 millimeters. 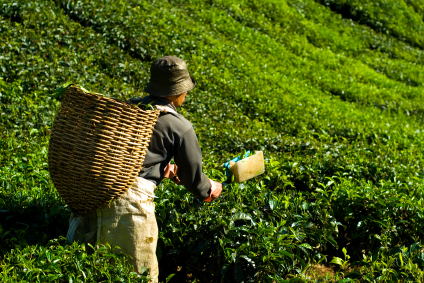 Tea production in the Assam region has declined in recent years, although the area under cultivation has risen. Fill in the blanks below, just as in the models. action act + ion There was a lot of action in the move. infection infect + ion Clean your cut or you will get an infection. This entry was posted on Monday, January 10th, 2011 at 10:19 pm and is filed under Downloadable Topics. You can follow any responses to this entry through the RSS 2.0 feed. You can leave a response, or trackback from your own site.